Yep. 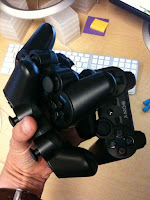 That's what a handful of Dual Shock controllers looks like. Bet I'd lose my grip if they all rumbled, though.